This book argues that socialism could return to the centre of political life in the advanced capitalist countries by pursuing the goal of economic democracy. But the book is not just directed at socialists. For its principal aim is to convince socialists and non-socialists alike that there is both a strong moral case for economic democracy and a feasible strategy for achieving it. 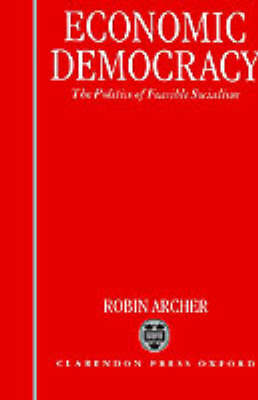 Robin Archer defines economic democracy as a system in which firms operate in a market economy but are governed by their workers. To show that economic democracy is a morally desirable goal he appeals to the value of individual freedom. To show that it is a feasible goal he appeals to the advantages of a corporatist industrial relations system. A corporatist system enables workers to pursue economic democracy through a series of trade-offs in which they exchange wage rises or other goods for incremental increases in control. But rational governments and capitalists will only agree to these trade-offs if certain conditions are met. Archer sets out these conditions and shows that they have in fact been met in recent years.